A clogged sewer line creates big problems with your plumbing, requiring sewer line repair. And usually, it’s has a lot to do with what’s going on outside of your house! Trees underneath the soil have a lot of roots which want to get into your pipes. Warm air in the pipes causes vapor to escape to the surrounding soil, which attracts roots. The roots seek tiny cracks, slightly loose joints, and other openings that will allow them to tap into this very dependable source of water. Clay tile pipes are most susceptible to invasion. But these roots can penetrate even concrete and PVC pipes. 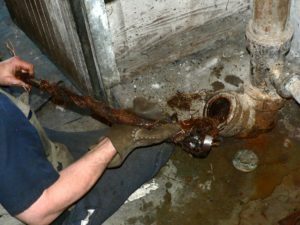 Eventually the roots will get into your pipes and even before the roots completely fill the pipe, they’ll cause other debris to back up and bog things down. If you’ve noticed that your drainage system has started to slow down a now may be the time to act. Tree roots are usually the main cause of sewer damage, but there are other ways as well. Objects can find their way into the line and become stuck. Extreme temperature changes and general deterioration can cause sewer problems, such as lines buckling or breaking. Ground shifting or improper installation can also lead to sewer line misalignment. 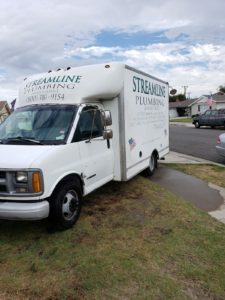 To help make an accurate diagnosis without digging up your yard, Streamline Plumbing can provide a video sewer inspection to see if sewer line repairs are necessary. This is a much more cost effective way in which by using a miniature camera to find out exactly whats going on. Video inspection can also check the condition of your pipes. It can tell you if an auger or high-pressure flush can solve the problem, or if more extensive repairs are necessary. Repairing underground sewer lines has always been a costly and labor-intensive process. In the past, sewer problems usually meant excavation on a large scale, with serious yard repairs needed once a sewer line repair was completed. Trenchless sewer repair is a faster and more landscape-friendly option to consider—especially if your sewer line runs beneath landscaping, trees, sidewalks, driveways or anything else you’d rather not ruin and then replace. Unlike traditional sewer line repair methods that uncover the entire line, only a few access points are needed. Once the work is completed, these access points are filled in so it’s hard to tell that any excavation was done. There are two approaches to trenchless sewer repair. With pipe bursting, the existing line is blown apart as a new pipe is pulled through it. With pipe relining, a fiberglass line is placed inside the faulty pipe to seal any damage. Your Streamline Plumbing sewer line repair professional can recommend the sewer repair method that is best for you. These experts also have all the equipment necessary to tackle just about any broken or collapsed line. Contact us today to see how we can help you diagnose your clogged sewer line or other sewer problems, and provide trenchless sewer line repairs.